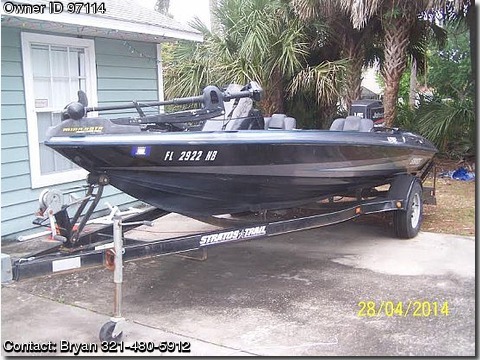 Please contact boat owner Bryan at 321-480-5912. 997 Stratos Bass Boat. 19 Ft with trailer. 1997 Johnson Faststrike 150, 2 props, one 3 blade, one 4 blade. Hotfoot. 24 volt Minnkota Trolling Motor. Garmin GPS map 178C Sounder Fishfinder, Depth finder, Humminbird wide 128 Fishfinder. Lots of storage, 2 Live Wells, Built in Cooler. New Power Pack, New Starting Battery, one new Deep Cycle Trooling Battery.